Sunday, December 9 at 8:15 p.m. nationwide broadcast (2,2 million viewers in 2017) Festival highlights. 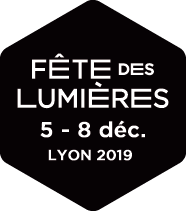 Lyon's popular local radio station is proud to be a partner of the Festival of Lights and the Lumignons du Cœur operation. Listen to Radio Scoop for all the latest Festival news and check out radioscoop.com and the Radio Scoop Lyon Facebook page.